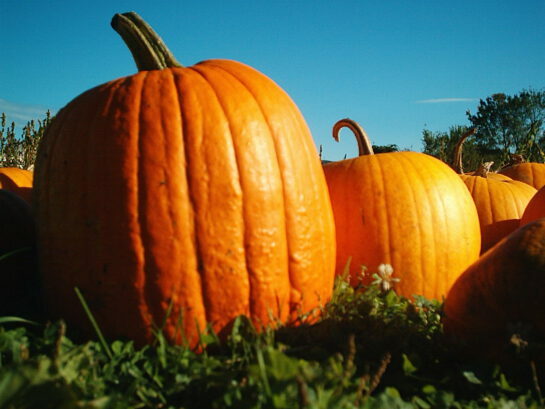 It's the Great-For-Your-Skin Pumpkin Celebration! It’s the Great-For-Your-Skin Pumpkin Celebration! Pumpkin Isn’t Just for Pie! Growing up, Thanksgiving was my favorite time of year. It meant a day with my cousins (and Aunts and Uncles), football, before-dinner snacks and my mother’s Pumpkin Pie. As I got older, my sister became the pie maker, and I became the quick bread maker, featuring, of course, pumpkin. I still bake my mother’s egg-less Pumpkin Bread and at one time, could make it from memory. The recipe card — worn, tattered and stained with oil and pumpkin, is a comforting reminder of family and friends. Fast forward a few decades and I’m more thoughtful about my skin than I am about pie. Pumpkin Oil is an excellent oil for hair, face and body and it’s the star of several new Essential products for skin of all ages. Pumpkin seed oil (PSO) is rich in vitamin E, zinc, omega 3- and 6- fatty acids as well as antioxidants. Talk about a superfood for your skin! Skin feels hydrated, supple and smooth and PSO helps maintain a youthful appearance. Pumpkin is also fabulous for hair, hydrating the follicles, locking in moisture and leaving shiny, lustrous strands, braids, coils, and curls. I use Exquisite Face, Hair & Body Oil, a blend of Pumpkin Oil, Pomegranate Oil, and Cranberry Oil, with a touch of Vitamin E, on my face at night, and I use it as a leave-in conditioner for my curly hair. I love how this oil blend is so silky and, well, indulgent. Because there are no Essential Oils in it, it smells of natural, earthy goodness. Perfect as a canvas for your EO blends or as is. Best of all? It applies lightly, and cleanly, absorbing quickly without leaving any heavy, oily feel. Available in Ready-to-Label cobalt blue one-ounce bottles with a treatment pump. And I’m happy about that because I can toss it in my carry on and hydrate in flight. My favorite use? A use it as an after-shower moisturizer with a little Neroli Essential Oil. And yes, my friends will be getting their very own bottles in their gift baskets this holiday season. Many of you are very familiar with our Pumpkin Masques. We offer two versions, one for licensed aestheticians, and the other for the rest of us. Both are packed full of pumpkin benefits. Our Pumpkin Masque (for the rest of us) is a delicious, exfoliating treatment targeting dull, maturing, and chaotic skin. In addition to being a delicious source of antioxidants & enzymes, Pumpkin contains more than 100 beneficial nutrients that help skin transition through the changing seasons. Blended with Meadowfoam Seed Oil, Organic Orange Peel Extract, Organic Lemon Peel Extract, Organic Neem Seed Oil, Rosemary Leaf Extract, Cinnamon Bark Powder, Ginger Root Powder, Allspice, and Nutmeg Powder, this masque is just right for fall. The Pro version is designed for spa use and provides a Pumpkin Peel to rejuvenate the face, hands, body or feet. The glycolic acid transforms dull, lifeless complexions into a more youthful appearing skin. Your customers will thank you for the renewed glow and softness of their skin. Introduced earlier this year, our Silky Luminous Lotion is created with a trifecta of hydration and moisturizing ingredients: Aloe, Shea and Pumpkin Oil. Silky, smooth opulence with an exquisite aroma is the best way to describe Silky Luminous Lotion. Blended with a delicate balance of Lavender, Clary Sage, Jasmine, Bulgarian Rose, Ylang Ylang and Neroli, Silky Luminous Lotion is great for more mature skin– especially face and decollete. This light and velvety lotion dries to a soft, powdery finish. Great for locking in moisture without feeling greasy. The addition of caffeine & lupine combined with antioxidants and essential amino acids condition and wake up our skin while the action of Palmitoyl Tripeptide-5 helps make skin look smooth and youthful. I loved to eat this bread still warm from the oven. No cream cheese. No butter. Just this delicious bread. I recommend you use the full recipe and make two loaves at a time. Just in case someone else in your home likes their Pumpkin served warm, right from the oven. Mix together the sugar, oil, water, and pumpkin. Add dry ingredients that have been sifted together. Bake 1 hour at 350 degrees in 4-1/2 x 8-1/2 greased and wax paper lined baking pans. Done when a toothpick comes out clean. Makes two loaves. Vice President, Sales & Marketing Val joined Essential in 2015 after working with us as a product marketing consultant for many years. A technology-industry escapee, Val has more than 20 years of experience in marketing, sales, and product management in e-commerce, digital marketing, and custom technology solutions. She is responsible for our Customer Service, Custom Sales, and Marketing teams and enjoys working with indie beauty businesses.